This, of course, is not the first time LP leadership has made fantastic asses of themselves. 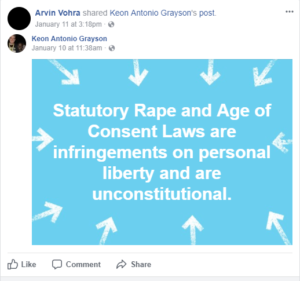 The LP’s social media team is notorious for idiotic postings. They have made posts referencing Satanist groups during the Christian Holy Week and attacking the Paul family. Of course, Vohra has put himself in hot water multiple times before as well. He did this by, among other things, attacking military members while courting Antifa and the Alt-Right. Even if one agrees with this, it does not behoove the second most important person of a party to purposely alienate so many potential supporters. And we all remember the naked guy incident. I bring this all up to make one simple point: The Libertarian Party is run by idiots for the enjoyment of idiots. It is not an effective platform for promoting pro-liberty policies and ideas. In fact, I am of the firm belief that it only discredits these ideas. The LP has elected only ten people to state office in its history. None of these ten are in office. Every LP member currently holding state office won their seat before joining. The most success the LP has ever had in a federal election was in 2016 with Gov. Gary Johnson. Gov. Johnson accrued over four million votes last election. Even this success, however, was despite the LP, not because of it. Gov. Johnson and his running-mate Gov. Bill Weld made their names as Republicans. They raised most of their money independent of the party. They gained most of their votes based on voter disgust with Pres. Donald Trump and Sec. Hillary Clinton. The most publicity the party offered their Governors was replays of the naked guy at the LP National Convention. I used to be a card-carrying LP member and believed in the LP’s ability to build a movement from the 2016 election success and general disgust with the two parties. I have since abandoned this ridiculous idea. 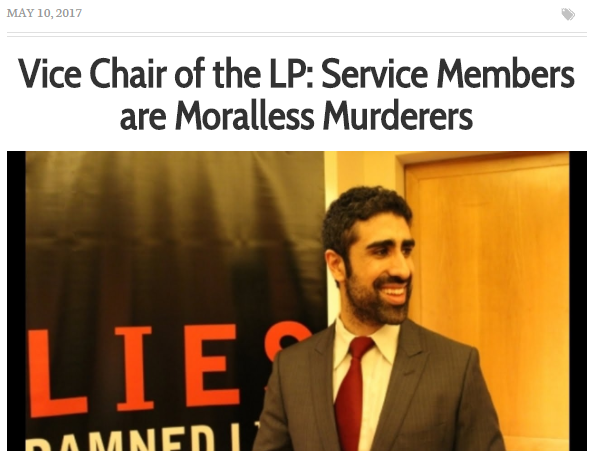 The LP has shown that they do not care about appealing to the public. They have instead chosen to appeal to Anarcho-Capitalist hardliners and attack groups and ideas that most people (even many LP members) agree with. What If I Still Want to Support Liberty? If you want to support liberty in America, the LP is an increasingly foolish outlet for your time and effort. Organizations such as the Cato Institute, the Foundation for Economic Education, and Right on Crime are doing far more for liberty in 2018. Donations to these organizations are worth far more than membership dues to the LP. If party politics is your thing, the GOP, as much as many do not want to believe it, is a superior vehicle to the LP for promoting liberty. Sen. Rand Paul, Rep. Thomas Massie, and Rep. Justin Amash have done more for liberty, individually, than the entire LP. You can get involved personally by attending county meetings and becoming party officers at the county and district level. If more pro-liberty people get into these positions they can help to move the GOP in a pro-liberty direction. Changing the GOP may be more difficult than changing the LP, but victory here means a massive political machine working for small government and individual liberty. Now, some people may insist that an independent Libertarian Party is still the best method for a freer America. As much as a disagree with this idea, there are groups who never the less are taking on the task of fixing it, and you oughta respect that. One of the biggest voices doing this work is the Libertarian Youth Caucus led by Trent Somes. They have shown to be a moderating voice seeking a growing party. Even if you aren’t a youth, consider sending them some support. This article is not the scream of a disgruntled ex-party member. Okay, it is a little. But it’s a scream with a purpose. As long as the movement for liberty is chained to the LP, it will be slowed down. Instead, we need to work to promote ideas of individual liberty through major parties and other pro-liberty organizations. By doing this, we can more effectively support our ideas on the grand stage and not worry about certain vice-chairmen apologizing for pedophilia or naked men dancing on stages.